We are sorry, friends, to state an obvious redundancy but we feel we must respond to recent insinuations. Friends of Wholefoods does not condone any form of bullying or harassment. We do not and will not participate in any form of harassment. Friends of Wholefoods believes that our contention is so strong that all we need to do is speak softly and say what needs to be said. We don’t need to push people or scare anyone into believing anything. Wholefoods has so many supporters who can see that Wholefoods has become an odious shadow of its former self that we don’t really need to do anything except turn up. However, we cannot control what everyone does with the information once we have put it out there. Regarding the recent political scribblings, Wholefoods has always been a space for street art and political messages. We are surprised that – amongst it all – specific messages could be found. We didn’t do the graffiti this time, but we don’t condemn it. Let us be clear: our problem is with the Monash Student Council Executive and their utter contempt for Wholefoods. We see staff as friends and colleagues who we expect to work beside before long. 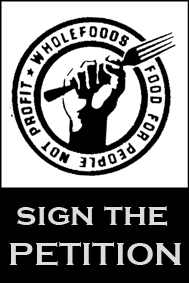 We see it as pointless to engage with the Wholefoods Manager: he is not the problem, it is the system imposed on Wholefoods by the MSC Executive.